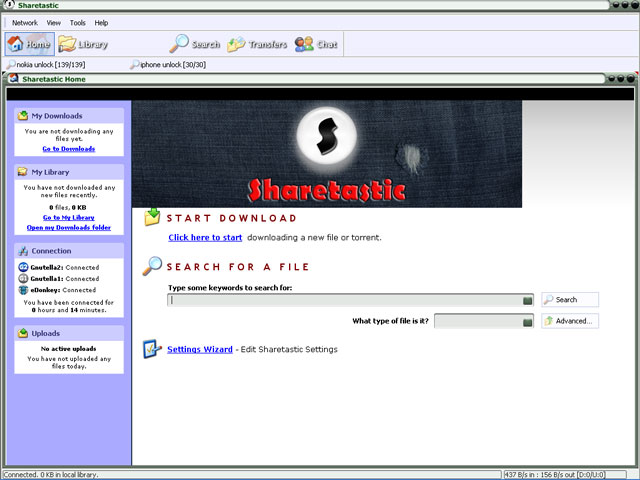 Sharetastic is a straightforward, solid file sharing program that simply knows what a user wants - it loads up exceptional features such as ghost ratings, a completely user-configurable queue area, and multinetwork. This application supports Gnutella2, Gnutella, eDonkey, and BitTorrent networks. You'll have no problem installing it (in seconds) and then managing it - searching, checking the network status, customizing the interface couldn't be easier. You'll get extremely quick search results and the possibility to preview files as they download due to an integrated media player for common audio and video formats Sharetastic includes. Sharetastic was developed with optimum performance from any number of sources in mind. The download queue is managed automatically but users can choose to operate manually and change the status of files themselves. A very complex file-management system is made up of folders variedly divided and categorized. What you'll definitely love about Sharetastic is its interface - neat and having all things so reasonably arranged. It has an upper and lower tool bar. The former is all about network connections, views, tools and help documentation while the lower graphical toolbar is actually your best friend when it comes to navigation functions like "home", "library", "media player", "search" and "transfers". In terms of ease and user-friendliness Sharetastic gets ahead of most of p2p clients currently available. Just hit the "Home" button and you'll see - all the options right there for you to see and best manage them. The application offers you much more information about the files and machines on the network than many of its "brothers" and, moreover it does a far better job at tracking the status of your many downloads. Sharetastic focuses on intuitiveness (its layout proves it) and stability. NOTE: Sharetastic is FREE!